Digital display monitors offer modern-day consumers information in a fast and easy manner, enhancing the customer experience in a varietyof environments. Whether it's an interactive video that illustrates a museum exhibit, a real-time display of flight information, or a restaurant menu featuring the day's specials, viewers rely on monitors to be up-to-date and provide the information they need in a clear, instant manner. Winmate's digital signage solutions, are a new breed of large digital displays that provide information and guidance in the public placesand demanding environments. 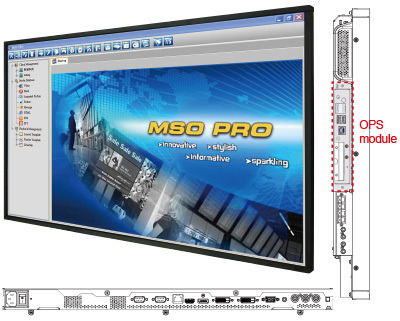 The Winmate Digital Signage PPC combines either a 42" or 55" panel PC with MSO PRO software, a flash network player solution for middle-scale digital signage networks. This panel PC is equipped with an Intel Core i3 Processor, capable of running demanding signage and multimedia applications.Our advanced digital signage solutions can also work in tandem with our rugged technology solutions, which use embedded systems that include a variety of rugged industrial PCs, Box PCs, as well as customized solutions. • Large screen sizes available in 42" or 55"
Winmate's innovative digital signage PPC solutions are currently in use in restaurants, retail settings, transportation facilities, hotels, museums, galleries, trade shows and more. Operating on Windows Embedded Standard 7, these PPCs offer the flexibility and power to support a wide range of display applications. With the 42-inch model featuring 500 nits and the 55-inch featuring 450 nits, Winmate digital signage ensures a large, bright and clear display. Size Model Name Display Spec. System Spec.